Today businesses need to make strategic decisions on the fly. Faced with constant need to adjust plans, reshuffle priorities or reassign employees, they need a way to capture the big picture of what makes their business successful: What resources they have available, and how are they utilized? What is their current and projected workload? Which projects are profitable and on track? Are we taking advantage of the individual talents of teams and matching them to the right projects? How do I keep my creative workers inspired and motivated? How do I give them independence and autonomy, while keeping my finger on the pulse of the business? Current tools either address one aspect of the business, or focus on the tactical details, failing to provide this big picture. 10,000ft is a design-inspired resource collaboration web application that allows dynamic organizations and the creative thinkers they employ to get a big picture view of the business, their teams and their projects. The result is a unique ability to make strategic decisions based on real time, complex data, increased autonomy and independence and ultimately, more opportunity to innovate. People use their choice of file sharing and task management solutions that are and the enterprise social media Yammer-s. The result is not very conducive of getting a big picture view of the organization or your team. 10,000ft focuses on top-level information for the key aspects of the organizationwhat projects we have, how they are progressing, what are people working on, are their talents matched to the different projects. Ultimately, the clarity 10,000ft provides optimizes decision making. 10,000ft provides the dynamic organization with the flexibility it needs to develop original work and change and adjust strategies as needed. While it allows the organization to chart long term plans, it also allows for a change of course. It also clearly shows how different decisions will impact the businessin terms of budget, utilization, or team balance. By helping organizations visualize different strategies for collaboration and project management, 10,000ft allows teams to remain flexible and nimble. People have the opportunity to experiment with different roles, while managers can try different team structures to address the diverse problems they need to solve. By giving people visibility into the project priorities and team structure, 10,000ft fosters autonomy, independence and freedom that today’s creative thinkers demand. 10,000ft creates a closer relationship between different levels of the organization, resulting in more productive, collaborative environment, with shared goals, interests and outcomes. 10,000ft supports trends that will define the future of workthe ability to form dynamic ad-hoc teams, the demand for transparency and the need to help the next generation of employees find meaning in what they do. An interactive schedule with a drag & drop user-interface that features visual controls and require minimal data entry, making it easy to dynamically resource and forecast in real-time. Real-time project statuses that show the impact of any scope and resourcing adjustment instantly and record changes in an easy to see activity feed, so that decisions can become decentralized. 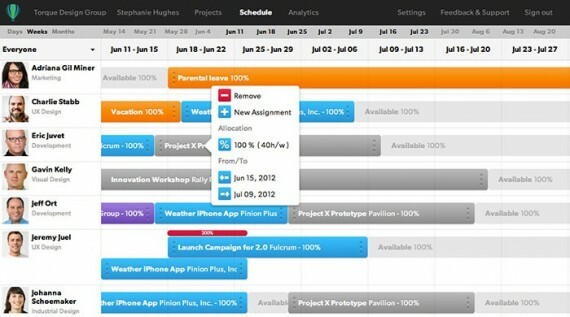 Phases and Tasks add depth to the project management capabilities and allow you to track project progress, assign roles, record milestones and keep your fingers on the pulse of multiple projects. At the same time, the level of detail does not encumber the overall schedule. Personalized pages for each team member shows allocated time for each project and an innovative painless time-tracking experience, where users just need to confirm time rather than enter it. Instant analytics and reports that can be customized with a few clicks without the need to program Excel formulas. Focus on clarity and must-have features rather than a broad spectrum of functionalities to preserve the focus on the Big Picture.